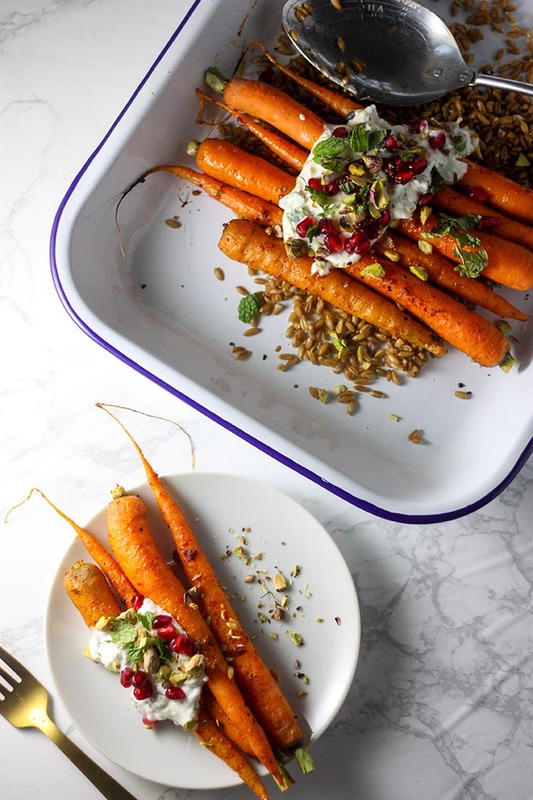 These harissa roasted carrots with farro are gorgeous for a holiday or winter side dish. A hint of spice cooled down with a beautiful mint lemon yoghurt dressing, this will be your go-to side for entertaining! Ok, you guys. Just sayin’. I am totally not equipped for the winter here in Portland. As I type this, it’s 35F/2C outside, we just got back from our local bar the other night (hence the mild rantiness that’s going on!) and I am SO DAMN COLD. And it’s not even below freezing. Basically, I’m doomed for the winter. The wind chill rn actually puts it at -2C for my Australian friends. No, NOT COOL. Usually, if it’s below 32/0, I am totally fine. Snow? Love it. Wind, and cold nope. bye. It’s been absolutely beautiful here, sunny days all week so I shouldn’t really complain but omg give me snow or sunshine any day over general coldness. In saying that though, American mayyyyy have converted me to prefer Christmas in winter. I know, shock horror. But everything makes SENSE! When you listen to Christmas music and carols, it is all relevant now! The decorative snow, the lights etc. It’s so much easy to get in the Christmas spirit when you’re forced inside because it’s too freaking cold to venture out, and just have to put on the Xmas lights because it gets dark at 4.30pm! It’s actually kind of exciting! And I dig it! Oh and don’t get me started on food, booze and warm drinks. Please. If I could spend the next 3 months hibernating, making food, sitting in front of the fire reading I’d be one happy girl. But alas adult responsibilities do not allow for that. Despite that, I can still spend a good portion of my day cooking, and shooting recipes for THCK, while Archie either a) sleep or b) witches, and it’s pretty darn good. These harissa roasted carrots with farro are my latest creation, and I am pretty darn smitten about them! It’s not often you find a side dish that’s filling AND easy to make, AND hearty! This dish combined my love for North African spices (aka harissa, my fav spice ever) with everyday coziness and comforts of winter. Picture this. Baby carrots, seasoned with harissa, baked in the oven, to go over a plate of hearty farro, finished off with a lemon mint yoghurt dressing. Are you convinced yet? Spice up your life a little this Christmas! 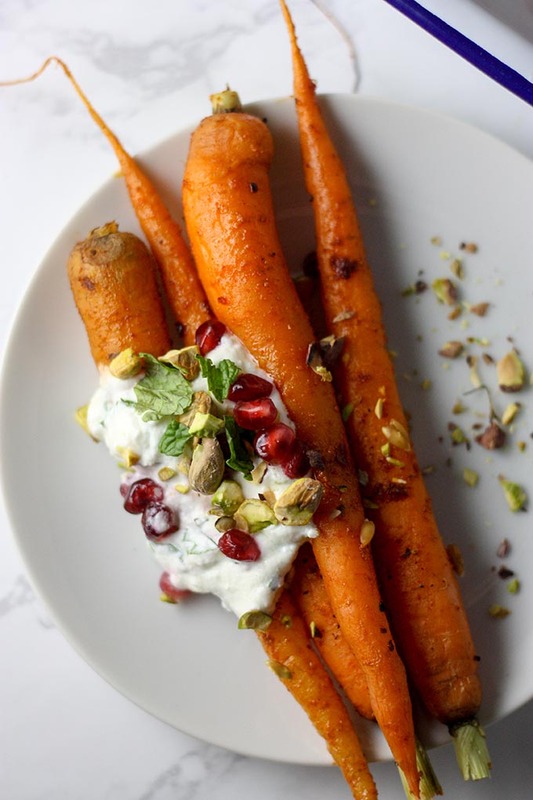 I guarantee you’ll love these harissa spiced roasted baby carrots with lemon mint yoghurt! The perfect Christmas side for north and southern hemisphere Christmas do’s! Much love, and any pro tips on surviving winter welcome. I am armed with 2 down coats, a woollen beanie, thermal underwear, long socks, wool boots and yet I am still cold! 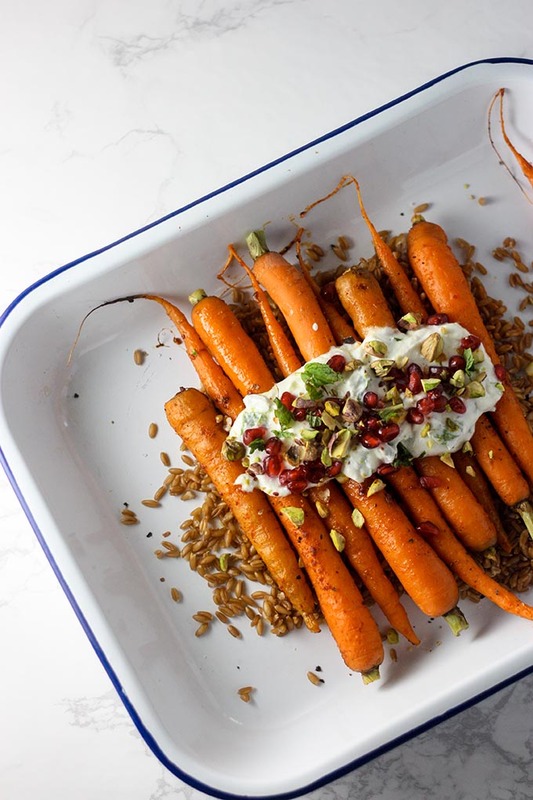 These harissa roasted carrots with farro are the perfect winter side. Made with North African spices, these are slightly spicy, slightly sweet and a whole lotta good! Place harissa, lemon juice, olive oil and a pinch of salt and pepper in a small bowl. Mix together well. Place carrots in a tray lined with baking paper. Coat with harissa spice mix, and use hands to mix together so every part of the carrot is covered. Place in oven and roast 30-40 minutes, or until carrots are still slightly crunchy. Meanwhile, place rinsed farro in a small saucepan with 2 cups of water, 1 teaspoon of olive oil and a pinch of salt. Taste test occasionally - farro is ready when it is still chewy but soft. Place farro in the bottom of a pretty baking tray or flat plate. Top with mint lemon yoghurt. Garnish with chopped pistachios and pomegranate seeds. What are you guys doing for Christmas? Winter fan? Yay or nay? He is growing up too fast! He lost 2 baby teeth the other day! On a side note, this photo is absolute gold! 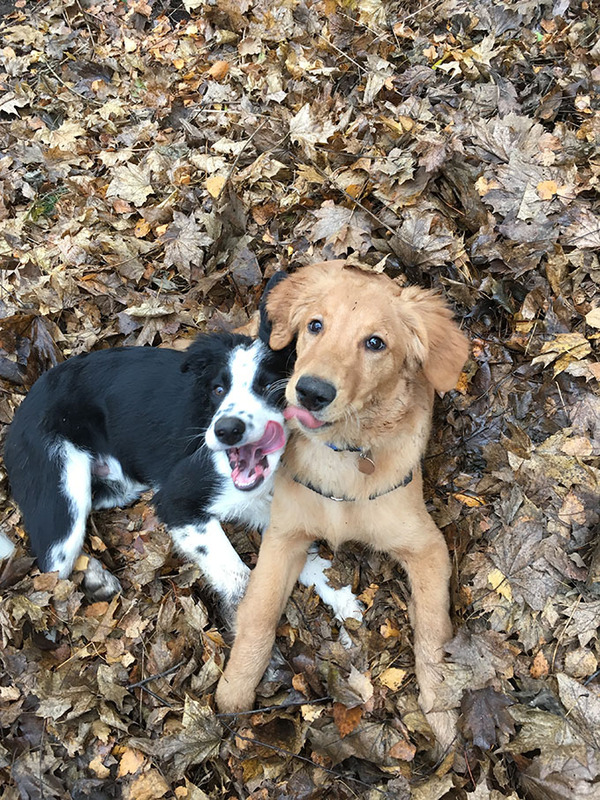 He had a play date with another puppy from puppy school the other day! Hahaha! I always wondered what it was like to celebrate Christmas in Australia and listen to songs about dashing through snow and winter wonderlands :). I’m up in Oregon now, too, and HOLY COW just no to how bitterly cold it is outside. It’s painful every time I step out the door to walk Cookie! Looooving these roasted carrots. Roasting is my favorite way to prepare veggies and I love that you added farro! These are so gorgeous! Love roasted carrots and this flavor combo sounds insane!! Thanks Molly! harissa would have to be one of my all time favourite spices! This side sounds incredibly good. I love roasted carrots and harissa and would think the contrast with the coolness of the mint yogurt sauce is just the thing to elevate them. It sounds so strange to me that you need to adjust to Christmas being in the winter, lol. As a child I wanted to experience what Christmas is like in the Southern hemisphere, but after spending a few years in Florida figured I’ve gotten a pretty good sense:) I will take the snow! Have a very Merry Christmas! I might be a born and raised Canadian, but I still HATE the winter, cold and snow. That being said, Christmas just wouldn’t be Christmas to me without the fluffy white snow!! You’re right, it makes listening to the music and decorating the tree that much more festive when there’s some fresh powder to go along with it!! Loving these baby carrots – what a perfect little side for a Christmas feast!! haha i SO wish it was snowing here! snow i can handle, rain i cannot! haha i’m the complete opposite – i can’t imagine having a warm christmas!! but anyways, this sounds awesome- super cozy, and on the healthier side (because let’s be real, i’ve been eating a lot of junk recently and will continue to do so for the rest of the month. oops). oh my gosh heather warm christmas’ are great! we have epic salads, sit outside sipping white wine, go to the beach play outdoor games! i did love our christmas this year though, we actualyl had snow! hope you had an amazing Christmas! Ugh, winter! Don’t want to think about right now but these gorgeous carrots would brighten any day, even snowy, cold ones! Such a perfect holiday side dish! thanks Sherri! I am not a winter fan either! I always forget about carrots as a side dish, but I love them! This recipe looks incredible. Thanks for sharing. I’ll be they’re delicious with the harissa topping! I love the flavors and colors here. This would be the perfect Thanksgiving side dish… with the red and orange and green. So pretty! thanks Dominique, I love the color combination too they are so festive! This might be the most beautiful presentation for carrots I have ever seen!! I have not yet tried farro, but it is on my to-do list! Aww thanks Cathleen! Farro is delicious and really easy to make! This would certainly be the prettiest dish on the Thanksgiving table! Love that you left the carrots whole and the combination with farro is inspired! A gorgeous dish! thanks Kiki! Farro just adds a little more oomph to the salad! Ha! I could not imagine having Christmas in the summer, I always tell my Australian friends this. But, as soon as Christmas is over I’m ready for warmer weather. Summer christmas’ are amazing, I love them!!! I’m always ready for warmer weather! 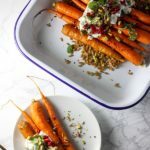 I love roasted carrots and love the addition of pomegranate farro to these! I grew up with warm weather Christmases and now live in cold weather too so totally get it!! yes! OMG it’s a struggle sometimes, especially when it doesn’t even snow where I live over Christmas! I just made the cutest green bean bacon bundles in place of a green bean casserole this year. I’m going for a more elevated look this Thanksgiving and these carrots are the perfect touch for a quick side dish! I hope you try them! They are so pretty too, I love that they look festive! This is such a beautiful side dish for the holidays and it sounds fantastic! thanks Tammy, I love making side dishes that are a little different! harissa is amazing! It can be super spicy sometimes, but it’s not crazy hot! I love this idea for carrots. I would love to give them a try very soon. The flavor sounds out of this world good. it is delicious! the yogurt and mint complement the spicy harissa really well!